Aston Barclay has made a number of additions to its management team as it plans for further sales growth and new product launches in 2018. 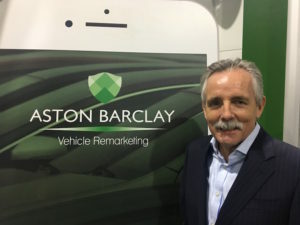 Ray Somerville, ex-Perrys CEO, has reshuffled the Aston Barclay sales team following his appointment as a non-executive director and strategy advisor. Following last June’s management buyout that injected a multi-million pound investment from Rutland Partners into Aston Barclay Group, the firm has appointed Ray Sommerville to the board as a non-executive director and strategy advisor. Sommerville was managing director and group chief executive of Perrys Group for 16 years and currently holds non-executive positions at GardX and Now Motor Retailing, trading as Now Vauxhall. He was also a non-executive director at Cox Automotive. Already Sommerville has rejigged the sales team, with Rob Wittridge becoming head of dealer new business and Gary Johnson joining from Manheim as dealer national sales manager. Nick Thompson joins from Copart as head of corporate and manufacturer new business to complete the new team. John Crichton has also joined Aston Barclay as its new commercial director and chief financial officer. He joins from Marston Holdings Ltd where he was chief financial officer of the UK’s largest judicial services group. Previously he was finance director of APCOA Parking UK. Meanwhile Alex Owen has been promoted to the position of group financial director to oversee the group’s day-to-day financial matters.